The Memorial Candle Program has been designed to help offset the costs associated with the hosting this Tribute Website in perpetuity. Through the lighting of a memorial candle, your thoughtful gesture will be recorded in the Book of Memories and the proceeds will go directly towards helping ensure that the family and friends of Catalina Rojas can continue to memorialize, re-visit, interact with each other and enhance this tribute for future generations. It is with a heavy heart our family announces the passing of Catalina P. Rojas on Tuesday, August 14, 2018 at the age of 96 years. Catalina was born in San Jose, Camarines Sur, Philippines. Predeceased by her husband, Severiano R. Rojas . 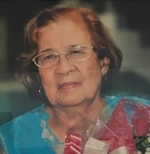 She is survived by her sister, nine children, grandchildren and great-grandchildren in Canada, United States and Philippines. Catalina will forever be in our hearts. Lamay/Viewing will be held on Friday, August 17, 2018 at 6:00pm at Mosaic Funeral Home, 1839 Inkster Blvd., Winnipeg, MB. Mass of the Resurrection will be held on Saturday, August 18, 2018 at 10:30am at Saint Anthony of Padua Hungarian Church, 365 Burnell St., Winnipeg, MB. She will be put to rest at Glen Eden Cemetery, 4477 Main St, following mass. Reception to follow at Le Merage, 99 Isabel St. Winnipeg, MB. To send flowers to the family of Catalina Picaso Rojas, please visit our Heartfelt Sympathies Store.